Choosing the right clothes for your body shape is so important, especially when it comes to your big day! Finding a flattering wedding suit will ensure you are the best dressed man and will give you great confidence. 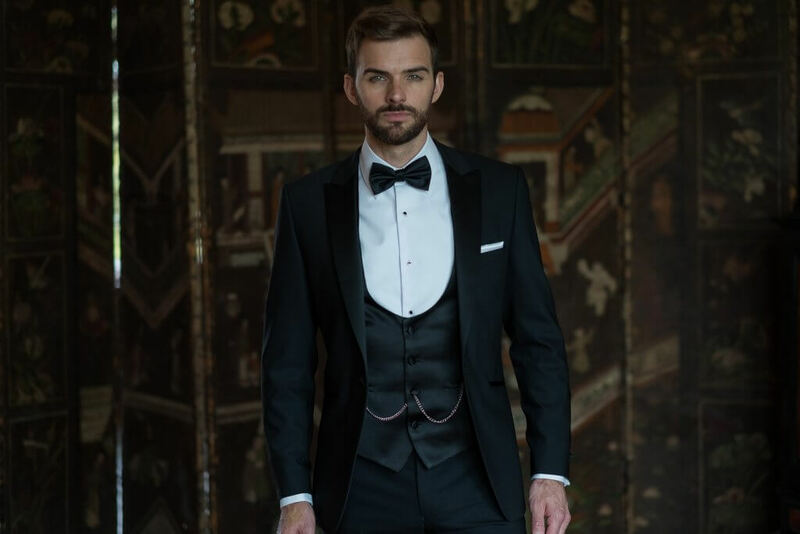 Whether you’re opting for wedding suit hire or a bespoke tailored suit we’ll help you dress for your body shape. At Whitfield and Ward, we have helped thousands of grooms, of all different shapes and sizes. Our helpful guide will give you some simple tips and advice to ensure you look great on your special day! The three main body shapes are triangle, inverted triangle and rectangle. 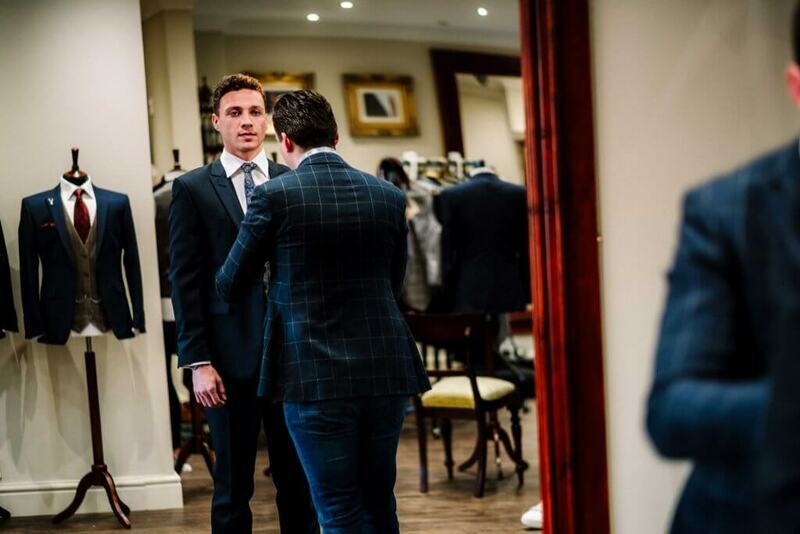 During our one-to-one consultation with you we’ll help guide and advise you on how to dress for your body shape to find the perfect wedding suit. The key thing to remember when picking a suit is that your body type and shape should always take priority over fashion trends. This shape is for men who are a little larger around the waist and hips in relation to the top part of their body. This doesn’t necessarily mean you are in bad shape but it can present a challenge as traditionally most men’s clothing is designed for broad shoulders and a narrower waist. The key to dressing this shape is finding a wedding suit that makes your entire body appear in proportion as well as creating the right balance and shape. 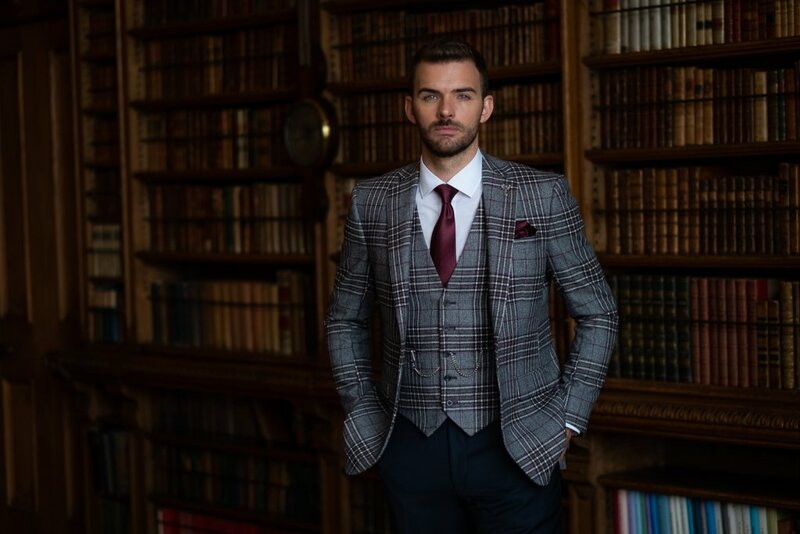 Combine checked jackets and fitted waistcoats with solid trousers. The mix of prints and solid colours will create the illusion of shape in your top half and take the focus away from the waist. Jackets with structured shoulders: A softly padded shoulder will exaggerate your proportionally narrower shoulders. Instead opt for structured shoulders which will help to square off your frame. Single-breasted suits and waistcoats: Avoid double-breasted jackets as they’ll add bulk to your waist. Slim fit single-breasted jackets will be much more effective. Your jackets should have a structured fit on the top but with extra room around the waist. 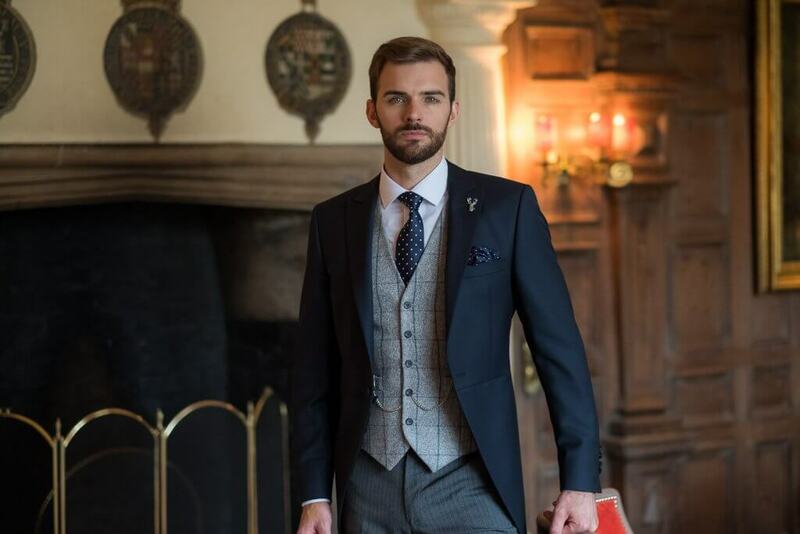 Look for wedding suit hire shop, like Whitfield and Ward, that offer a range of cuts to experiment with or consider a bespoke suit. The high cut-away opening of the jacket, narrows the waist area and makes the legs appear longer. The wide high peak lapels also help to broaden a narrower upper torso creating a more flattering shape. If your chest and shoulders are significantly broader in comparison to your waist and hips you’re an inverted triangle. Working out regularly at the gym will give you great results with accentuated shoulders and thighs, and a narrow waist but buying clothes off the peg presents its challenges for this body type. I’m sure you’ve found that the suit jacket that fits your shoulders simply doesn’t fit your waist. We aim to show off all your hard work by emphasising the clean, sharp lines of your torso. Jackets: This shape will definitely need a slim-fit ‘Drop 8’ jacket which has a large drop in size from chest to waist to suit this silhouette. Again, if you’re hiring, look for a wedding suit shop, like Whitfield and Ward, that offer a range of cuts including our Highgrove Drop 8. A lower opening draws the eye down, narrowing the chest area so you appear more balanced. This style of waistcoat will also fit better over large pecs. Slim-fit shirts: We’d recommend wearing a fitted shirt to show off your body, teamed with braces to really give you the edge. At Whitfield and Ward we offer both slim and regular fit shirts and we can also tailor your shirt to give you the ultimate fit. Slim-leg trousers: If you have a very slim legs and broad shoulder, ultra-skinny trousers can make you look unbalanced. A slim fit trouser will look a lot better. Wearing patterned or checked trousers can look really good and will balance your comparatively broad upper body. Trousers with larger seat: This type of athletic build can often have large glutes too so you may find it hard to get trousers off the peg that fit. At Whitfield and Ward you can buy a larger waist size and have them tailored or consider going bespoke. 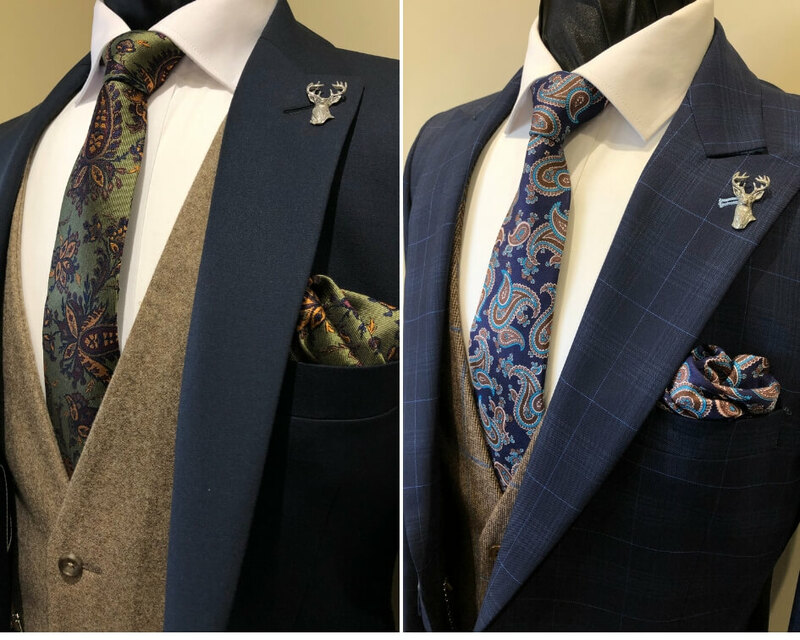 With some of the challenges off the peg presents you may need to consider having a bespoke suit that is designed to fit and balance your proportions. Men with a rectangular body shape usually have a tall and thin frame. Their shoulders are roughly the same width as their waist and hips. The key here is to use your clothes to widen the shoulders, create a nipped-in silhouette across the middle of the body to create an illusion of structure. Structured tailoring: Double-breasted jackets surprisingly does little for the rectangle-shaped body. Try a single-breasted style with plenty of structure in the shoulders instead. A waistcoat is an absolute must that will add instant bulk to your frame. We’d suggest a higher V waistcoat that will square your chest up and broaden your upper body. Check and contrast colour waistcoats: Will visually break up and broaden you and expand the dimensions of your otherwise slim frame. Finding the right suit for your shape isn’t as easy as it seems but we can help make your body shape work for you so that you can look and feel amazing on your big day. If you’d like some help with what to wear on your wedding day, then get in touch with us by calling 01625 536 545, we’d love to help!